In 2000 Nambiti Conservancy was founded by Mr Rob Le Sueur. He started the venture by purchasing a cattle and game farm named Woodlands (3500ha). Soon after that the farms of Brakfontein, Maizelands and Links were purchased. He combined the three farms consisting of 5000ha. The Zigalala and Driefontein farms (1200ha) separated the Northern and Southern sections of the reserve and were purchased in 2006/2007. At the end of 2007 the fences were dropped between the Northern and Southern sections allowing the game to move freely throughout the reserve, and Nambiti Conservancy changed its name to Nambiti Private Game Reserve (9000ha). Currently the reserve is enclosed by 54km’s of fencing and extends 11km’s from North to South and 5 km’s East to West. The first lodge built on the reserve was called Umzolozolo. It was finished in 2005 and Elephant Rock, Springbok Lodge and Zintulo (now Nambiti Hills) soon followed. Woodlands’s and Driefontein farm houses were also converted into lodges. Idwala and Nambiti Plains were finished in 2008 and Esiweni and Lions Valley lodge were completed in 2009. When the original farms were bought they had game such as Kudu, Impala, Eland, Giraffe and Reed buck. Further introduction of game started in 2000 and is ongoing. The introduction of ‘Africa’s Big 5′ started in 2002 with the arrival of 11 elephants. Two bulls from Sabi Sands and a breeding herd of 9 individuals, consisting of cows and calf’s from Phinda Game Reserve. The enclosure constructed on Boma Road, with the huge unloading ramp, was designed to hold the breeding herd during their acclimatization period and is now known as "Double Boma". Six rhino’s were introduced in 2003, one mature bull, three sub adult bulls and a cow with a calf. Four cheetahs from Karongwe and De wildt game reserves were introduced in 2005 and placed into the elephant boma which had been divided in two so that male and females could be housed separately. Six hippos were also introduced the same year. Two male lion’s from Phinda and two female Lions from Karongwe arrived in 2006 and were also held in the double boma. 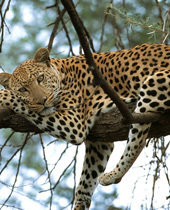 Leopards are the only member of the big 5 that have always been in the area. Sightings of them have been extremely rare and the closest we have come to seeing them is through footprints and spoor. Besides the leopards that were there originally, Nambiti has released other leopards onto to the reserve. The last of the ‘Big 5′ to arrive on Nambiti were 15 Buffalo bulls in 2007 from a private breeder in the Karkloof area. They were originally held in the Brakfontein boma and then released into the Northern section of the reserve before the fences were dropped. The breeding herd of buffalo consisting of 9 cows and 2 bull calves arrived in 2010.